In the winter of 1998, Sarah Gerhardt paddled out a long channel to the surf spot called Mavericks. It was a dangerous break with frigid water, jagged rocks, and powerful waves that could reach 60 to 100 feet in height. The break had already claimed one life. As Gerhardt bobbed on her surfboard, she had no idea that, a few months later, she would become the first woman to surf the legendary break—although someone else in the water that day did. “I saw her sitting in the channel and I paddled up and asked her what was going on, and she said she was just watching her husband, Mike,” remembered Frosty Hesson, a legendary big-wave surfer and mentor whose life was portrayed by Gerard Butler in the 2012 movie Chasing Mavericks. “I told her, well, I don’t know you but I know that’s not what I’m seeing,” Hesson said. What he saw instead, he said in a telephone interview from his Soquel home, was “analysis and inquiry and questioning and resolve.” She was studying the waves, cataloging them. Later that day, Hesson said, he told board shaper Bob Pearson he’d just met the woman who would be the first female to ride Mavericks. In February 1999, that’s exactly what Gerhardt did. Talk to Gerhardt and you’ll find the roots of what Hesson saw that day: an independent woman shaped by the poverty, illness, and sometimes homelessness of her family. 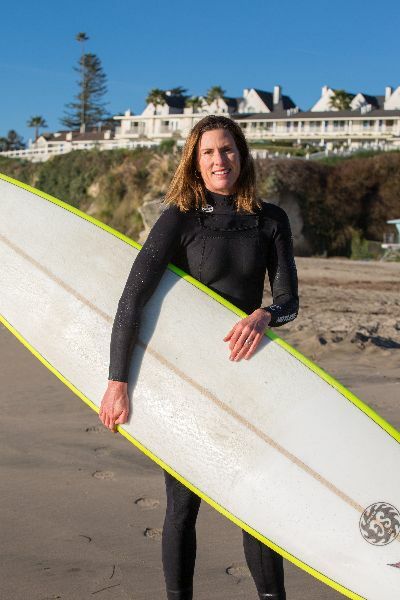 A strong woman who found her place in the water, who became one of the top female big–wave riders just for the joy of it, and a chemistry professor who earned her Ph.D. in physical chemistry from UC Santa Cruz in 2003. This winter, she also may well be one of the first women to compete in the spot’s infamous contest, now called the Mavericks Challenge and organized by the World Surfing League. It will be the first time a women’s heat will be included in the contest, which has been held only 10 times since the inaugural competition in 1999 because conditions haven’t always been good enough to hold the event. Organizers have until Feb. 28 to run the contest under optimal conditions of big waves and mild weather. Sitting in the backyard of her Westside home and watching over her 12-year-old daughter’s new kitten, Gerhardt said she grew up on the beaches of Hawaii, but not in the charming way of movies. Her father had taken the family to the Big Island to study astronomy, but because they had no money, they ate, slept, and lived on the beach, she said. Later, disabling symptoms of a form of muscular dystrophy put her mother in a wheelchair and turned Gerhardt and her sister into their mother’s chief caretakers. The family had moved to California at this point, and during the first five months of Gerhardt’s freshman year of high school in Pismo Beach, she and her mother were homeless. Water became her refuge from caregiving duties, from the allergies and asthma that plagued her onshore, from the rough edges of her life. Eventually, she fell in with a group of talented male surfers, including her now-husband Mike Gerhardt, and was soon riding giant waves: 25 feet, 30 feet, 45 feet. They sounded like freight trains and moved with an intensity that set hearts racing and adrenaline pumping. Terrie Williams, UC Santa Cruz professor of ecology and evolutionary biology, once strapped a heart monitor on Gerhardt as she rode the waves at Mavericks. The monitor recorded a sustained heart rate of more than 180 beats per minute—or 90 percent of maximum—for an entire three-hour session. 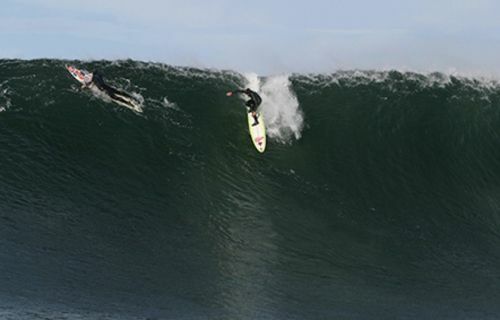 “The heart of a Mavericks surfer is like a cheetah on steroids,” Williams was quoted as saying. But to be in that moment takes a lot of preparation. Gerhardt runs, mountain bikes, swims in the UC Santa Cruz masters program, and does yoga once a week. On the day of the interview she’d done sit-ups, lunges, squats, and pull-ups before going for a run and then getting in the water later to surf. Perhaps, most importantly, she also takes stock of her mental state. She runs through a Mavericks session beforehand, imagining how she will feel the lift of the water, how she will paddle into the wave, how she will leap to her feet. She writes in her journal and reads the Bible. That desire to live a full life also extends to her husband and two children, and is what brings her into the classroom, first at Monterey Peninsula College and now at Cabrillo Community College. She wants to expose students to the beauty and practicality of chemistry and also to help them acquire the skills necessary for learning, she said. Right now, Gerhardt is waiting for the go-signal to see if she will seal another place in history—one of the first women to surf in the all-male Mavericks contest—but she is also living her life as mother, wife, teacher, and athlete. She broke off the conversation to rescue the wandering kitten from a tree and then excused herself. She didn’t want to be late for the women’s march.